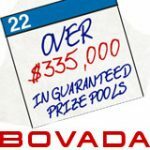 This July 6 play for your share of $280K guaranteed prize pools in thirteen scheduled Bovada Poker tournaments. 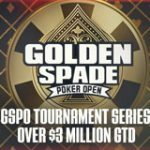 The selection of online poker tournaments includes two Main Events and Heads-up tournament plus a variety of poker game types and stake levels. 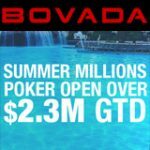 USA poker players should take Monday off to play these Bovada Poker tournaments if they not playing the 2015 WSOP Main Event. 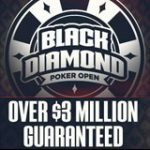 You can start qualifying for all the scheduled tournaments by playing daily satellite tournaments which start from just $0.33. 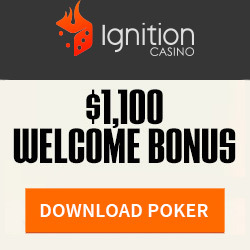 Sign-up as a new players and get up to $1,000 bonus with your first deposit. Bovada Poker is only available to US players based in states where there is no poker prohibition or regulated market. 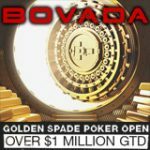 Play the Mad Monday Bovada Poker tournaments on July 6 which features over $280,000 in guaranteed prize pools spread across thirteen events. 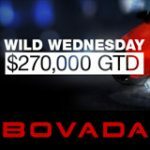 The Mad Monday tournaments have buy-ins of all stake levels with buy-ins that range from $2.20 up to $270. See the full schedule of events below which include a mini Main Event, Main Event and Heads-up event. 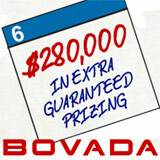 Players can register for the Bovada Poker tournaments in the lobby under the tournament tab.